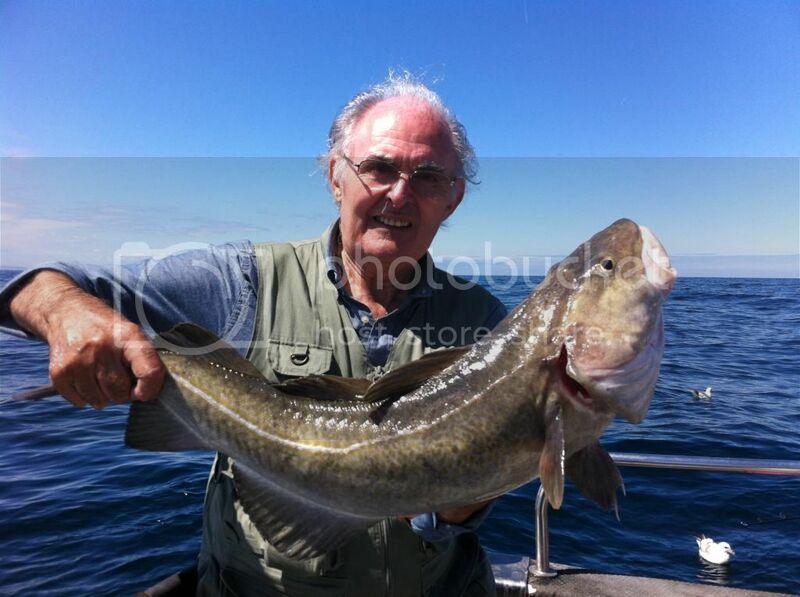 Discussion in 'Sea Fishing Forum - Shore, Boat & Kayak Fishing' started by bigcod, Jun 23, 2014. 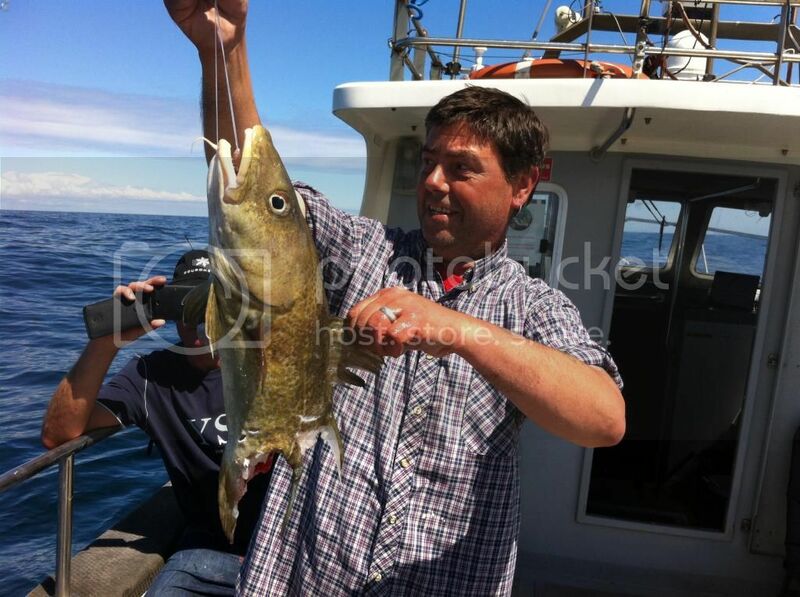 The story and pictures are copyright to Paul Kilpatrick and www.whitbyseaanglers.co.uk. Press are permitted to use the pictures and story on the understanding that a live link to www.whitbyseaanglers.co.uk must be placed alongside them wherever they appear on the internet. Or if they are to be used in a newspaper or magazine then the final sentence of the article should read - "Sea Otter 2 Skipper Paul Kilpatrick is a regular contributor to The Whitby Fishing Forums, you can read more about this story and others like it at www.whitbyseaanglers.co.uk"
The first two days of The Whitby Angling Festival have gone well on Sea Otter 2. 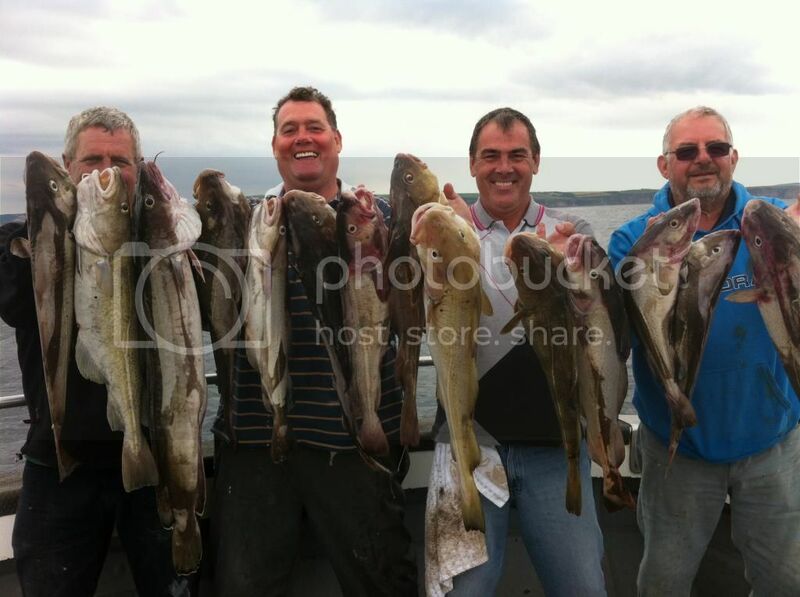 The lads have had 2 cracking days fishing and a bag full of fillets to take home on each day. 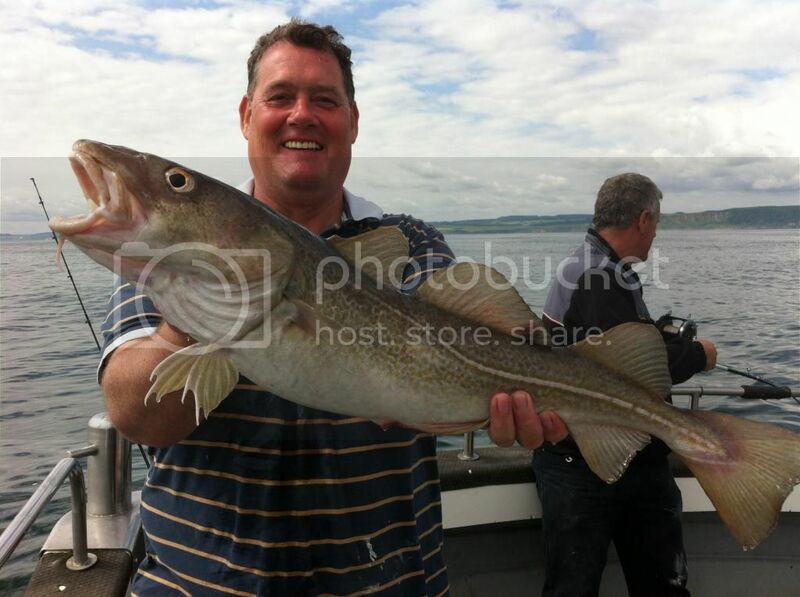 John turnballs party on saturday got non stop action out on the 18 mile fishing grounds. 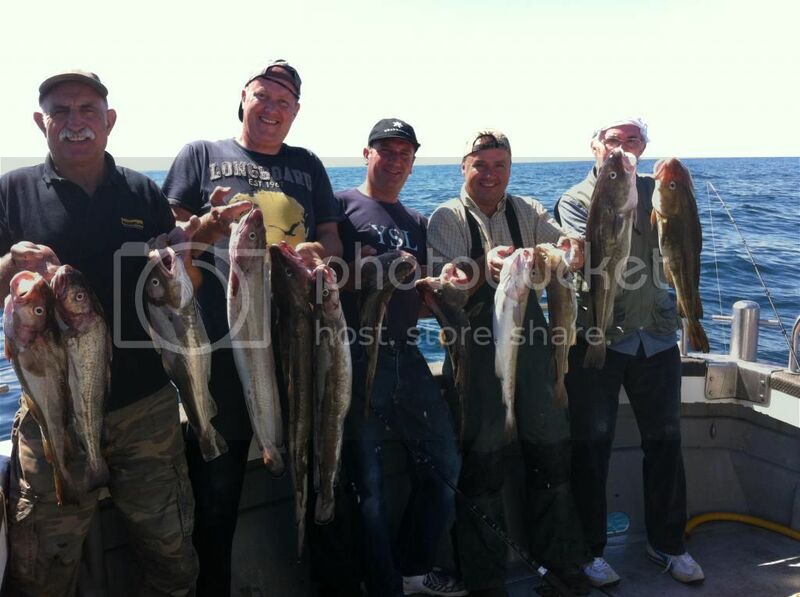 The 5 lads who booked the boat for themselves had around 80-90 cod and ling between them. There was nothing massive, with the best fish around the 9lb mark but stacks of them. So a belting day, but it was midway through the afternoon that got everybody on there toes. One of the lads was winding a good sized cod up when 20ft under the boat a very large porbeagle suddenly appeared and attacked the lads fish in a swipe it bit the cod completly in half a fish of around 8lb the lads couldnt believe what they were seeing the shark circled the boat for a few minuites before swimming away he must been 8ft long around 400lb mark a very big fish. The lads yesterday one of my long standing regualar teams had a great day only 4 lads this time chartering the boat they all had top teens of fish so they were well happy those big ones are evading us at the moment a little slow start on the board but i am sure we will be finding something a big bigger very shortly. The Porbeagle bites the cod in half . 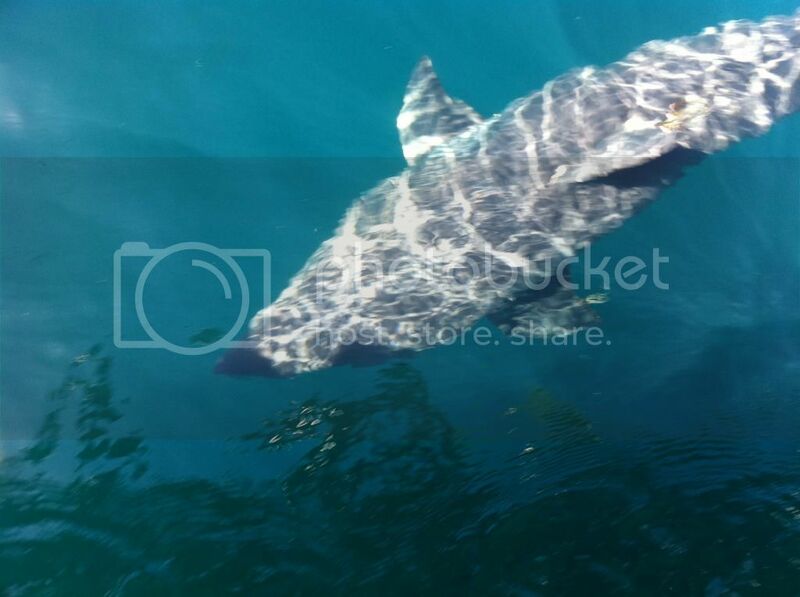 He swims straight under the boat. My crewman dave inspects the ravaged cod even he he a bit shocked you can see it was a nice fish or it was a nice fish. Still a corking days fishing for the lads and they saw a real shark the lads with just a few of there fish. Sundays crew got a taste of some very good shad fishing again the those big doubles are evading us but for how long time will tell the lads had a great day fishing a couple of them are on all week so they are very excited fingers crossed. 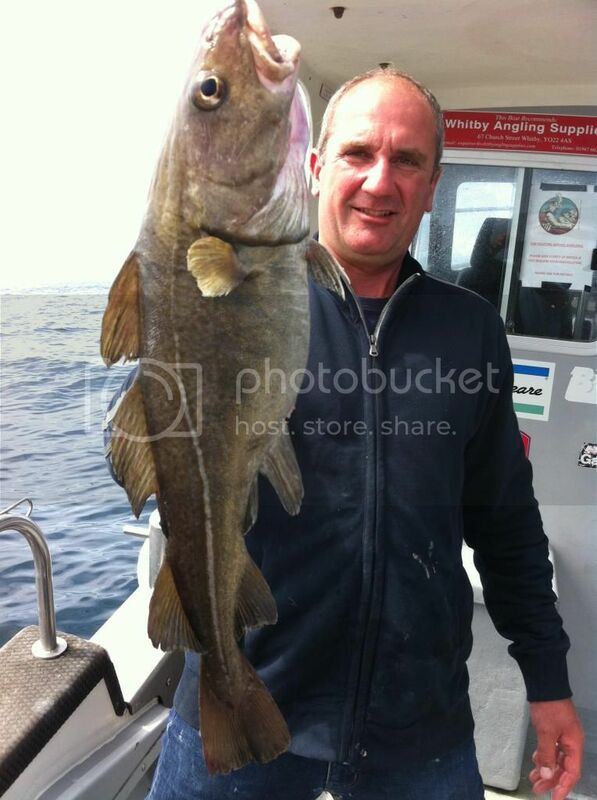 Gary jones with a nice cod on the shad. Next drop he nails another. 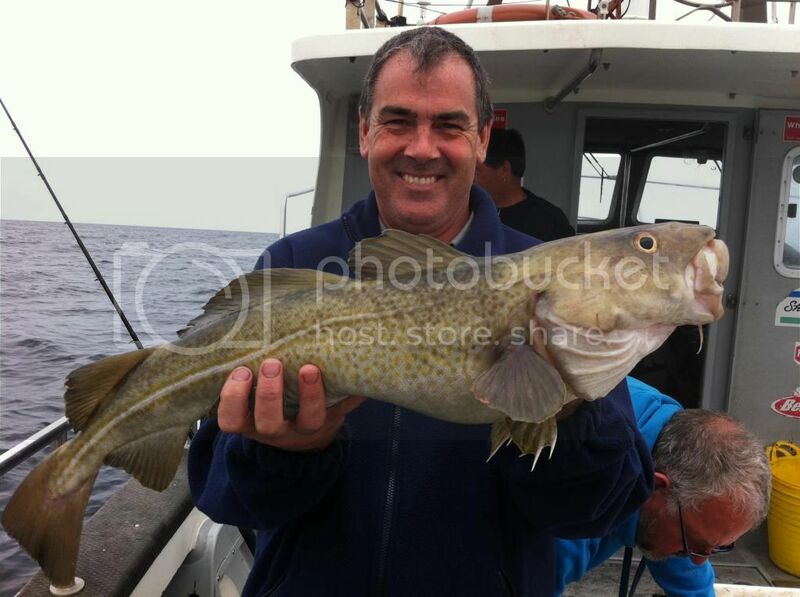 John gets a nice cod. Big smiles all round a great days fishing for the boys again around 80-100 fish on the boat . Nice report Paul . Your never to far away from a biggy only a matter of time now mate . 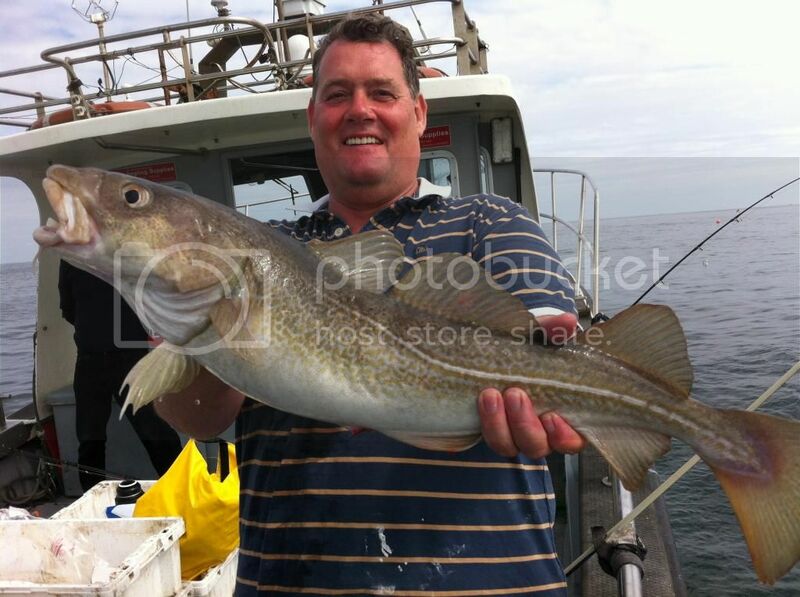 The lads had another belting monday nearly all cod john managed to get off on the board so he we go . Quality fishing and fantastic pictures of the Porgie.. I think your gonna need a bigger boat! 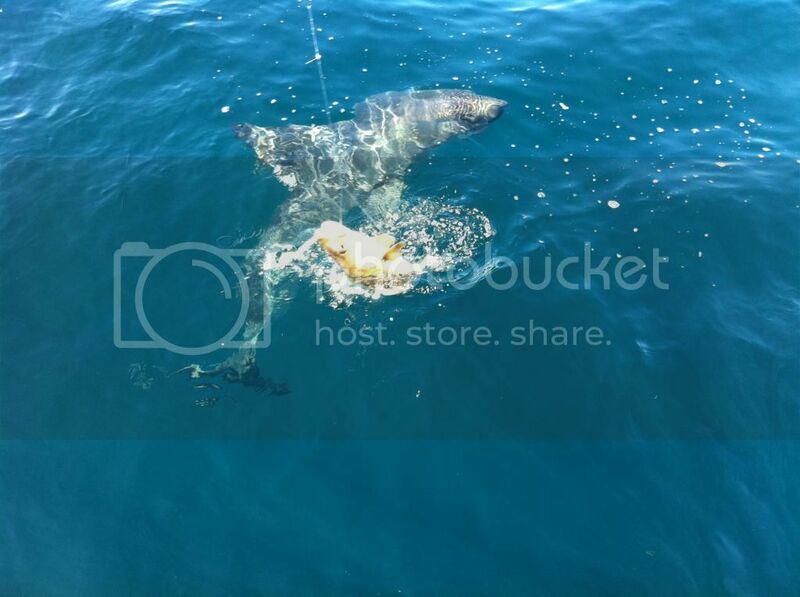 To be honest that's biggist porgy I have seen in all the years of chartering and to get eye to eye contact right next to the boat was a bit special it was a beast of a fish the sharking lads look like that they are in for a bumper summer . Cracking to see, how far off were you when that beast showed ? 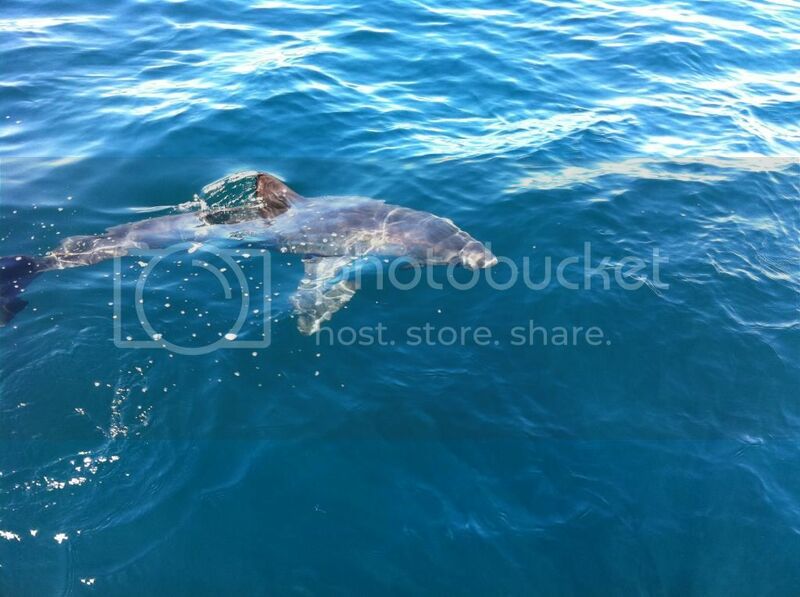 Hi mick we were on a wreck 18 mile from whitby but i think they are all over place and i understand a shark came around a chaterboat just 5 mile off the other day so plenty of them appearing this summer. 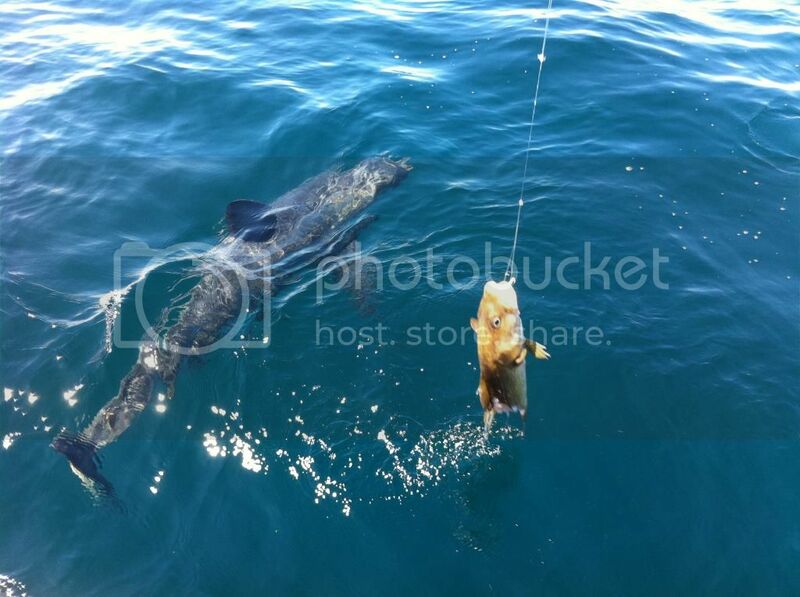 The lad was just amaized carl as to what had grabbed his cod but he didnt care when he saw the shark.